New South Wales is Australia’s premier market for the technology sector, including the digital creative, innovation, information and communications technology (ICT) and startup industries. The sector offers great opportunities for investing in, moving or starting a new business. It has vast innovative talent driving new technologies, advanced research and innovation institutions, and a favourable regulatory and business environment. NSW is Australia’s ICT capital, exporting A$1.9 billion in ICT services in 2015–16. It has leading telecommunications infrastructure, including nine landings of international high-capacity fibre-optic cables that link the state to Asia, Europe and the United States. This capacity is growing with the rollout of Australia’s National Broadband Network, an Australian Government initiative that is connecting regional and urban areas to a 100 megabit-per-second fibre communications network. NSW is also a world-class environment for data centres, data storage and managed services hosting. Global Switch, the leading wholesale data centre provider in Europe and the Asia-Pacific region, has a base in the state, as do Alibaba Cloud, Rackspace, Amazon Web Services, Dimension Data and Vocus Communications. NSW boasts a large pool of skilled labour and has more people working in ICT-related fields than anywhere else in Australia, with 107,600 people working as ICT managers or ICT professionals in 2015–16. This includes around 42,200 software and applications programmers, and 12,600 database/systems administrators and ICT security specialists. It is also a regional leader in ICT research and commercialisation. The state is home to several national centres of excellence in ICT-related research fields, as well as two Cooperative Research Centres and four research and development facilities under the National Collaborative Research Infrastructure Strategy. It leads all other Australian states and territories with ICT research capabilities, with 11 universities producing almost 3,300 IT graduates in 2015 . NSW tertiary institutions such as the University of Sydney and the University of New South Wales (UNSW) regularly partner with companies and other tertiary institutions around the world in cutting-edge ICT research and innovation. For example, UNSW has been involved in a world-leading quantum computing project. The state’s success is enhanced by the NSW Government’s Knowledge Hubs program. This program encourages collaboration, improves productivity and competitiveness, champions projects and research with broad industry benefits, and promotes sector-wide market opportunities. The program has established industry-led collaborative partnerships centred around industry sectors. These include energy and resources, digital creative, financial services, medical technology (medtech), and transport and logistics. The state’s agriculture and food products sector is among the most innovative in the country. In 2013–14, NSW agriculture businesses spent more than A$32 million on research and development (R&D), and food product manufacturers spent A$215 million. 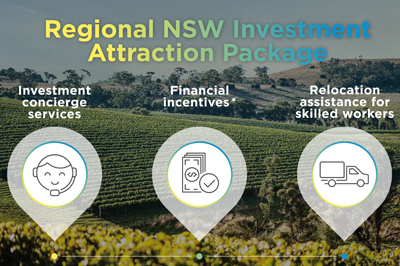 The NSW Government gives the sector strong support, investing in a range of programs and research projects. Many of these projects are headed by world leaders in their field – to drive innovation and find practical solutions to productivity and sustainability challenges. It is also directing strategic investment towards ‘frontier’ technologies, particularly in the agriculture, biotechnology, fisheries, functional foods and genomics sectors. Medtech is thriving in NSW, with more than 50% of Australia’s medtech industry based in the state, including Cochlear, makers of the ‘bionic ear’. This is boosted by the NSW Government’s Medical Devices Fund, which helps to bring local innovations to market. The concentration of financial and professional services companies in NSW has made it a magnet for financial technology (fintech) companies. Fintech startups have boomed in Australia, from fewer than 100 in 2014 to nearly 600 in July 2017. Most of these are based in NSW. This is partly because of Sydney’s purpose-built fintech infrastructure. NSW is also an ideal test market – large enough to offer the diversity of a major economy, but small enough to make testing financially viable. A 2017 KPMG report named Australia as the second-largest market for emerging and established firms globally, with Sydney boasting 70% of those included in the study. The city was also ranked the eighth-strongest fintech hub in the Global FinTech Hubs Federation’s 2017 review. NSW is a global leader in developing and using groundbreaking smart city technologies that are providing solutions to worldwide urban infrastructure challenges – helping make cities sustainable, resilient and liveable. The state is also a leader in smart transport. The NSW Government has begun trials of driverless vehicles at Sydney Olympic Park, and trucks are being connected to intelligent transport systems. These systems allow heavy vehicles to communicate with each other and with infrastructure. In addition, Australia’s first driverless metro rail is due to open in Sydney in 2019. NSW also has world-class urban infrastructure research and development facilities such as the SMART Infrastructure Facility at the University of Wollongong, south of Sydney. This centre is an international leader in applied infrastructure research. Finally, the Commonwealth Scientific and Industrial Research Organisation’s Data61 is developing innovative technologies that will ensure Australia’s cities are sustainable into the future.